The first pressure test of the 2020 U.S. presidential cycle, the Iowa caucuses, is one year out. Not only is Iowa the first state to hold a presidential nominating contest each election year, it is also a general election battleground state that has picked the winner in every election since 2004. Although Democrats fared well in the 2018 election across the country, taking back the U.S. House and winning several key Midwest governorships, their candidates in Iowa did not all deliver resounding victories. Iowa Democrats gained two U.S. House seats, including Rep. Abby Finkenauer’s toppling of two-term incumbent Rod Blum, thanks to her compelling personal narrative and emphasis on working-class issues. But statewide, the re-election of Gov. Kim Reynolds was a serious blow for progressives. The blue wave might have surged across Pennsylvania, Michigan and Wisconsin, but it did not crest the Hawkeye State’s red wall. The 2018 elections are part of a worrying trend for Democrats in Iowa. Two years earlier, Trump carried 93 of Iowa’s 99 counties and secured a 9-point margin of victory statewide over Hillary Clinton. Between 2012 and 2016, Iowa’s drop in Democratic vote share at the presidential level was the largest of any state in the country. Contributing to this trend is Democrats’ waning standing with rural voters in Iowa, which, unaddressed, will continue to haunt candidates. To better understand the views of this important electorate, Working America set out to gauge the mood in working-class neighborhoods of both the Democratic base and swing voters in eastern Iowa. In the course of our conversations, we did not endorse or oppose any potential presidential candidate, but we did explore qualities voters are looking for in their next president and how they feel about Democrats’ prospects in 2020. The Iowa caucus and the overall primary contest will be a crucial test for Democratic presidential candidates to show they can rebuild after the crater left by President Trump in 2016. The findings in this Front Porch Focus Group Report are based on conversations with 304 voters held from Oct. 22 to Dec. 14, 2018, in Cedar Rapids, Dubuque and Cedar Falls, as well as smaller communities such as Dyersville. One in 5 swing voters (21%) already say they will back President Trump in 2020. Yet, the electorate is still largely up for grabs, with a large portion of Democratic base voters (42%) and more than half of swing voters (53%) undecided on who they support for president. While the Democratic base is consolidated in opposition to Trump, our conversations revealed widespread anxiety and uncertainty about Democrats’ prospects of defeating the president in 2020, and a lack of consensus on which candidate could best compete against Trump. Indeed, just under half of Democratic base voters are confident their party will win in 2020 (49%), while more than 4 in 10 (41%) said they were unsure about the next election. Consistent with what we heard from Iowans in May 2018, disaffection with politicians continues, especially among swing voters. Close to half of swing voters say it makes no difference to their economic prospects if Democrats or Republicans hold power, and similar numbers cannot name an elected official who is fighting for them. 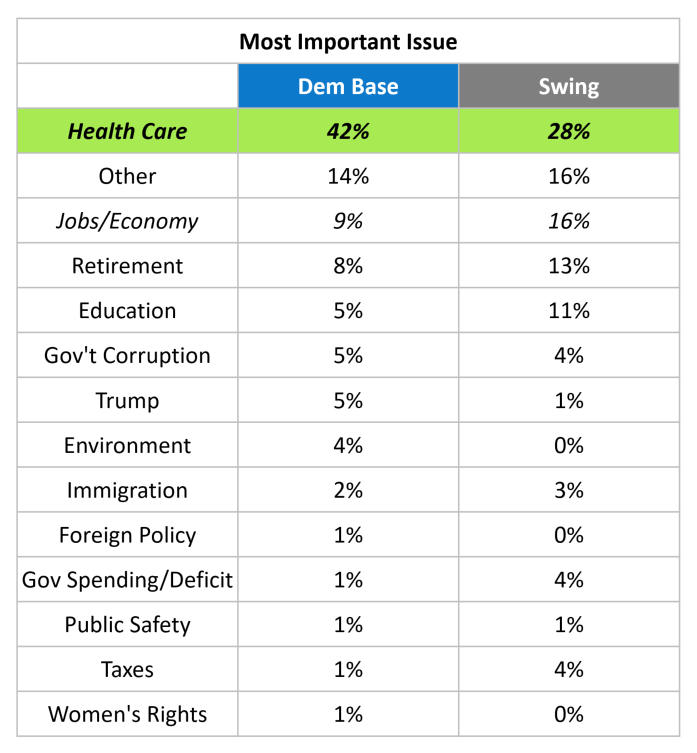 Showing no signs of abating before 2020, health care is the top issue for both Democratic base and swing voters. Iowans hold some of the grimmest views of personal economic well-being in the country, and Democrats will need to re-establish credibility on the issue of jobs and the economy. Frustrated by politicians who parachute in for campaigns, Iowans are looking for presidential candidates who understand the complexity of their state. 1. One in 5 swing voters (21%) already say they will back President Trump in 2020. Yet, the electorate is still largely up for grabs, with a large portion of Democratic base voters (42%) and more than half of swing voters (53%) undecided on who they support for president. When we asked voters, “Looking ahead to the 2020 presidential election, who would you most like to vote for in the presidential election?” 1 in 5 swing voters already indicated a preference for Trump. In contrast, only 1 percent of Democratic base voters support him for president. Among Democratic base voters, 57 percent said they plan to vote for the Democratic candidate, while 42 percent said they weren’t sure how they would cast their ballot. Over half of swing voters were undecided about 2020 (53%). Comparing Trump’s job approval/disapproval among the Democratic base (10%/86%) and swing voter segments (40%/53%) to the 2020 vote choice, it is clear that more voters are saying “no” to Trump than settling on his replacement. Voters may disapprove of Trump, but they are not sure about the solution, indicating an electorate that is still fundamentally up for grabs. 2. While the Democratic base is consolidated in opposition to Trump, our conversations revealed widespread anxiety and uncertainty about Democrats’ prospects of defeating the president in 2020, and a lack of consensus on which candidate could best compete against Trump. Indeed, just under half of Democratic base voters are confident their party will win in 2020 (49%), while more than 4 in 10 (41%) said they were unsure about the next election. We asked voters, “Who do you think will win the 2020 election?” Despite the strong showing for Democrats in the 2018 midterm elections, voters in Iowa expressed uncertainty about Democrats’ prospects of retaking the White House in 2020. Democratic base voters are not confident about the party’s chances in 2020. Half of Democratic base voters think their party will win the next presidential election, but 41 percent said they were unsure, and 10 percent predicted that Trump will be reelected. Uncertainty is even higher among swing voters – nearly half (49%) said they didn’t know who will win in 2020, 1 in 5 think the Democratic candidate will win, and nearly one-third (31%) thought that Trump would win a second term. Nervous Democratic base voters were desperate to ensure Trump does not have a second term. When we asked voters who they would most likely vote for, many framed their responses in terms of “must-win” electability, or those with the best odds of defeating Trump. I truly hope a Democratic candidate will win, but I am worried Trump will win again. In order to win, the Democrats really will have to get everyone out to vote. We need a good strong candidate to stand behind. 3. Close to half of swing voters say it makes no difference to their economic prospects if Democrats or Republicans hold power, and similar numbers cannot name an elected official who is fighting for them. Consistent with what we heard from Iowans in May 2018, disaffection with politicians continues, especially among swing voters. We asked voters whether economic circumstances improved when a particular party, either Democrats or Republicans, held power. The chart shows responses to that question, separating Democratic base from swing voters. Almost half of swing voters, and even 1 out of 5 Democrats, see no difference when either major party holds power. What is notable about the chart above is the prevalence of voters who see no difference in economic circumstances between Republican or Democratic control of the government. As with the question, “Who in politics is fighting for you?” the question of economic circumstances reveals a disaffection with the status quo and a deep cynicism about our political system. Moreover, this disaffection isn’t new — in a Front Porch Focus Group report conducted in March and April of last year, we found that solid majorities had no opinion of elected officials such as former Rep. Rod Blum or Gov. Kim Reynolds. Moreover, that survey found 71 percent of the people we spoke with believed no politician was fighting for them. It may be that campaigns raised the name recognition of certain figures, but it’s clear that there’s widespread cynicism and disaffection among Iowa voters. 4. Showing no signs of abating before 2020, health care is the top issue for both Democratic base and swing voters. While voters haven’t yet given a conclusive signal on 2020 candidate preference, they’re crystal clear on the issues that have a direct impact on their lives. It’s no secret that health care dominated the 2018 midterm elections. Across the country, protections for people with pre-existing conditions became a central campaign issue. However, concerns about health care are far broader than that. A year out from the Iowa caucuses, candidate preferences may remain murky, but voters don’t express uncertainty about their economic concerns, and health care is chief among them. For 2020 hopefuls, health care may well answer the question of how Democrats secure the support of both Democratic base voters critical to the nomination and swing voters critical the general election. 5. Iowans hold some of the grimmest views of personal economic well-being in the country, and Democrats will need to re-establish credibility on the issue of jobs and the economy. We’ve spoken with voters across the country and asked them to rate their confidence in their personal economic future. Iowans economic confidence is similar to that of African-American voters in Ohio or Latinx voters in Modesto, California. Compared to voters in Ohio’s 12th Congressional District — which contains rural and suburban areas around Columbus — Iowans’ economic confidence is between 30 and 38 points lower— perhaps explaining the state’s 16-point swing from the 2012 to 2016 elections, one of the largest in the country. These levels of economic confidence are among the lowest we have tracked anywhere in the country and resemble communities that are subject to political volatility and voter disengagement. Voters’ bleak outlook on their economic circumstances, along with higher rates of indecision on candidate choice, underscore the extent to which voters do not connect political decisions to the solutions they are seeking. This finding presents Democrats with an opportunity to draw needed connections and make a bold case for progressive policies that relate to people’s lived experience. 6. Frustrated by politicians who parachute in for campaigns, Iowans are looking for presidential candidates who appreciate the complexity of their state. In our conversations with voters, we asked, “What’s one thing that presidential candidates consistently don’t understand about Iowa?” The answers reveal that many Iowans feel stereotyped and pandered to by presidential candidates. We also found a range of opinions on Iowa’s status as an agricultural state. Some voters emphasized the diversity of Iowa’s economy, and others stressed the importance of agriculture while highlighting the fact that many presidential candidates seem to have a shallow understanding of the state’s needs. The disaffection and cynicism that manifests itself in Iowans’ low economic confidence also seems to be affecting their assessment of presidential campaigns. Economic worry is prevalent and is the source of most health care concerns. A great number of prospective voters are deeply concerned about the economy, especially the cost of health care. They’re worried about their fates, and the future of their families, in a time of rapid change. When canvassers engage voters in conversations about the issues that have salience in their lives, many are willing to hear new information and shift their perspective. Looking ahead, Democrats need to convince working-class people that they are fighting for regular people, that they have bold solutions to address economic concerns, and will stand up for everyday working people when in office. The frustration with politics is pervasive. Working-class voters often feel powerless to change a government that they do not see as respecting their concerns or serving their needs. They want things to be different, but despair that they ever will be. Our experience suggests these voters will remain volatile into 2020, unless we engage them on bread-and-butter issues and connect the dots between their real concerns and the choices they’re making at the polls. Working America, as an organization with an ongoing presence in working-class communities, credibly broadens the discussion from elections to political accountability. We talked to voters not just about their vote choice, but the importance of holding elected officials accountable after the election, and we found this useful in addressing voter frustration. The medium is central to the message. For Democrats, simply turning up the volume on political communications through the same channels will not quell the distrust or break through to voters. Face-to-face conversations are critical for giving people the space to discuss and debate difficult issues. Working-class voters are hungry for an independent voice to deliver clear information, someone with whom they can discuss the issues. The appeal of Trump in 2016 was because he “spoke his mind.” Ahead of 2020, our in-person engagement — a combination of validation and information — will give persuadable voters and those who have lost faith in politics a reason to vote. Beginning the conversation by asking, “What matters to you?” instead of telling voters what should matter to them gets a more receptive audience. Winning back the confidence of these voters is essential for gaining control of Congress and for building strength in the states ahead of redistricting fights after 2020. Unlike traditional public opinion polling, which is based on a random sample of people representative of a given population, we targeted swing and likely Democratic base voters in eastern Iowa. From Oct. 22 to Dec. 14, 2018, we spoke with 304 registered voters. We canvassed in Cedar Falls, Cedar Rapids, Dubuque, Dyersville and Waterloo. To get a more precise indicator of the partisan leanings of voters, we used the Catalist Vote Choice Index [VCI] score, which assigns a value of 0-100 to each voter, with higher scores signaling Democratic support and lower scores signaling GOP support. The model uses demographics, voting history, geography, and other information to predict candidate support. In order to reach swing and likely Democratic voters, we only spoke with voters with a VCI score of 30 or above. Swing voters were defined as voters having a score of 30-70 (sample mean: 51), and likely Democratic voters were defined as having a score of 70-100 (sample mean: 91).